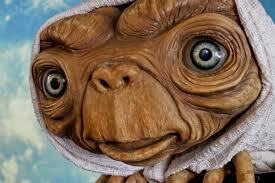 This world famous classic is transformed into an interactive journey in Universal Studios attraction, E.T. Adventure. The celebrated motion picture is well known for its epic bicycle scene. In a desperate attempt to deliver the alien to safety, Elliot and his siblings help E.T. escape Earth by journeying through the sky via cycle. That's exactly what park attendees will experience! Since 1990 it has spread to parks around the globe, but, as it is the original, the Orlando location includes more features. The queue features clips from the making of the movie on numerous television monitors. Various contributors of the original production share their experiences with audience members as they wait to board. Once the audience members pass through the outer queue, they enter a room where Steven Spielberg himself introduces the attraction in a short pre-show. He explains E.T. 's desperate situation. He must be delivered home safely in order to save his dying planet. His magical green healing abilities are the only hope for his planet! Spielberg entreats the audience members to help the stranded alien. The last stretch of line wraps through a enchanted forest, where the police are searching for park guests assisting E.T. in his great escape. After receiving pleas for help from E.T. 's teacher, Botanicus, the spectators are ushered onto carts, where they are seated on a bicycle seat. Every "vehicle" of bikes seats 12 people equipped with safety bars. At the front of the vehicle, in the middle, seats E.T. E.T. Adventure is a "dark ride", meaning that while riders travel on mobile seats. Riders are shown high-tech visuals and special effects. Dark rides are not necessarily dark, but they do require a closed ambiance to enhance the experience for riders. The beginning of the ride is intended to be dark and intimidating to help riders understand the desperation of E.T. 's situation. Once audience members have successfully aided E.T. in his escape, they fly through outer space where the second half of the ride is a stark contrast to the depressing atmosphere of the first. Riders are greeted with lots of bright beautiful lighting and joyous singing. Before exiting the ride, riders pass by animatronic versions of E.T. 's friends that they have just rescued. E.T. waves farewell in gratitude. Must be 34 inches or taller to ride. Just about everyone is welcome to join E.T. in his great escape. Don't forget your Interplanetary Passport!